The Creative City concept claims a progressive urban development approach to enhance social cohesion and inclusionary processes. 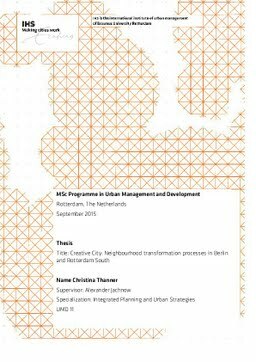 In this context the research is analysing how the Creative Class, with the example of Creative Initiatives as self-organised groups, is impacting the outcome of Place-making activities in the transformation processes of two deprived neighbourhoods in Berlin and Rotterdam South. The focus lies in gaining more knowledge of the conditions, which facilitates the sense of identity of the Neighbourhood Community with their physical and social urban environment they live in. First, the research analysis why the Creative Class was attracted to the two studied neighbourhoods. As a next step, the concept of Self-organization is used to understand why the Creative Initiatives got active and how they interacted with the Formal Side in the evolution phase of urban transformation processes. The impact of self-organised interactions on Place-making activities is analysed to assess Identity Building and Place Quality within the changing environment. A qualitative comparative two-case study is chosen in which local citizens in Creative Initiatives take the lead. The analysis is conducted based on semi-structured interviews and secondary data. The study’s findings show that a tolerant, open and diverse environment attracts the first generation of the Creative Class and an existing art community network attracts the second generation. The results of the research also present that the emergent of a new form of Collaborative Governance did not provide improved conditions for an advanced sense of Community Building in the neighbourhood. The two case studies show that the Creative Initiatives’ interest as end-users of the improved environment is the main factor hindering inclusionary processes between the Creative Initiatives and Neighbourhood Community. The results of this research demonstrate that the emergence of a new status of Collaborative Governance out of self-organised interactions is not enhancing the outcome of Place-Making activities in deprived neighbourhoods and is leading into a citizen top-down approach of a powerful elite. For a progressive urban development concept, the Creative City approach needs more insight of the interaction patterns between the Creative Class and the Neighbourhood Community. It is recommended that further application of the concept of Self-Organization be conducted in order to compare methods and findings.